While it seems especially severe in the South Shore areas and on Cape Cod, where the outbreak is just as bad as it was in 1981, it was more widespread in that year. (In the forests of the western region of the state there is relatively little defoliation.) This outbreak has been building for several years and is definitely more extensive this year than last. Overall, the resurgence of gypsy moth has been a surprise for research entomologists like Elkinton, many of whom focused on gypsy moth back in the 1980s, when it was, without question, the most serious insect pest of shade trees in New England. In 1989 a major change took place that converted gypsy moth to an almost-non-pest in our region. In that year, a fungal pathogen of gypsy moth from Japan became established and decimated gypsy moth populations throughout New England. This pathogen is very specific to gypsy moth. It attacks only a few other closely-related species. This pathogen apparently arrived accidentally. Earlier researchers in North America had tried to establish it, but those efforts apparently failed. Perhaps the new strain that did become established was especially adapted to North American conditions. The fungus is heavily dependent on rainfall in May and June. An especially heavy rainy spring took place in 1989. Prior to that year, widespread outbreaks of gypsy moth had occurred about every 10 years. The biggest one was in 1981 when virtually the entire state was defoliated. In 1989, the time was ripe for another widespread outbreak, but it was nipped in the bud by the new fungal pathogen. In subsequent years, Elkinton and his colleagues spread the pathogen to other states including Virginia and Michigan, but the fungus also spread on its own by way of airborne spores. The result that was that by 1996, the fungus was widespread across the eastern North America, wherever gypsy moth populations existed. Since that time there have been virtually no outbreaks in New England… until the last year or two. The fungus is still present in the population, but drought conditions in May of 2015 and in June of this year have prevented the fungal epidemic from taking off. Hence, we have had an outbreak. The fungus is one of two pathogens operating in the gypsy moth system. The other one is a virus disease called nuclear polyhedrosis virus (NPV). Both diseases attack the larval stage of gypsy moth and cause fairly similar symptoms. Infected larvae die head down on the trunks of trees or in an inverted V shape. Spores of the fungus are produced that spread by wind to other larvae. The virus produces spores also that are readily distinguished from the fungal spores. The two diseases have a very different ecology. The fungus can cause high mortality in low-density populations, and hence has played a major role in keeping gypsy moth populations low for the last 35 years. The virus, which has always been present with gypsy moth in North America, (at least since the early 20th century) causes high mortality only in high-density populations. It plays a major role in causing the collapse of gypsy moth outbreaks, which otherwise might continue on year after year. So we are likely to see quite a bit of the virus in areas that have been defoliated this year. Gypsy moth outbreaks in Massachusetts date back to their introduction from Europe in 1868. Gypsy moth outbreaks have always been especially prevalent in stands dominated by their preferred host trees, including oaks and aspen. Oak-dominated stands are especially widespread in eastern and southern Massachusetts. In the maple-dominated stands of the Berkshires, gypsy moth outbreaks have always been much less widespread. But in any stand, if the outbreak takes hold, almost any tree can be defoliated, including pine trees, hemlocks and maples. Hemlocks are especially intolerant of defoliation. 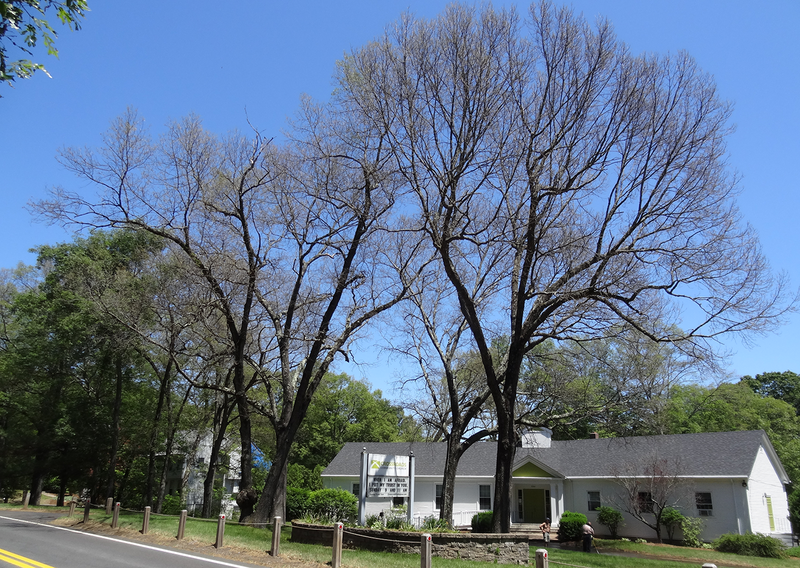 Ash trees are one of the few species never defoliated by gypsy moth. After a defoliation by gypsy moth, most deciduous trees will put out a new set of leaves that same year. Tree mortality occurs when the trees are under stress. For example, this year, 2016, we are under severe drought conditions and that may hamper re-foliation. Some trees may have been defoliated first by winter moth and then the second set of leaves by gypsy moth. On Cape Cod, the black oak gall wasp adds to the challenge. Multiple stresses like this can cause widespread tree mortality. What can a homeowner do? You can certainly help your trees now by watering them. The gypsy moth life cycle is as follows. The overwintering stage is the egg, which occur in masses laid on the trunks of trees and are covered with tawny brown hair. There are up to 600 eggs per egg mass laid by one female. The eggs hatch in early May at about the same time that the tree leaves expand. The larvae grow through five or six moults (or instars) and complete their development by the end of June or early July. They then form pupae, which can be seen in clusters on the trunks of trees or in the leaf litter. Gypsy moth larvae do not spin cocoons. After about two weeks the adults emerge. Female gypsy moths have white wings, but they do not fly. The female invests all her resources in egg production and leaves the flying to the males. Male gypsy moths are brown and are attracted to a pheromone produced by the female. The males and females mate and she proceeds to lay a single egg mass, typically on the trunk of the tree or on other objects. This occurs in late July or early August. The eggs then lie dormant until the following spring, when the larvae hatch. Homeowners can inspect their trees and property for these egg masses in the fall or winter. Lots of egg masses will mean continuing outbreak next year. It is important to distinguish this year’s egg masses which are firm, from the ones from last year, which are spongy. Attempts to control the population by other means such as with sticky bands on trees or deploying pheromone traps typically do not work. Prior to 1980, aerial application of pesticides to the forests in many parts of the Northeast occurred. This involved DDT in the 1950s and 1960s, and was supplanted by less-environmentally damaging pesticides as we learned about the environmental effects of DDT and other similar pesticides. In subsequent years, safer pesticides such as Bt became available. Even without the fungus, we now understand that gypsy moth outbreaks will subside and most trees will recover. Shade trees in homeowners’ yards, however, are another matter. It makes sense to protect them and to care for them with watering. The lifecycle determines the timing and feasibility of various control options. Gypsy moth populations can be suppressed with pesticides provided they are applied in early May. Homeowners who have valuable shade trees in their yards can protect their trees by employing a licensed applicator or arborist to properly apply the correct pesticide. But by now, late June, there’s nothing to be done now for this year, 2016. It is too late.